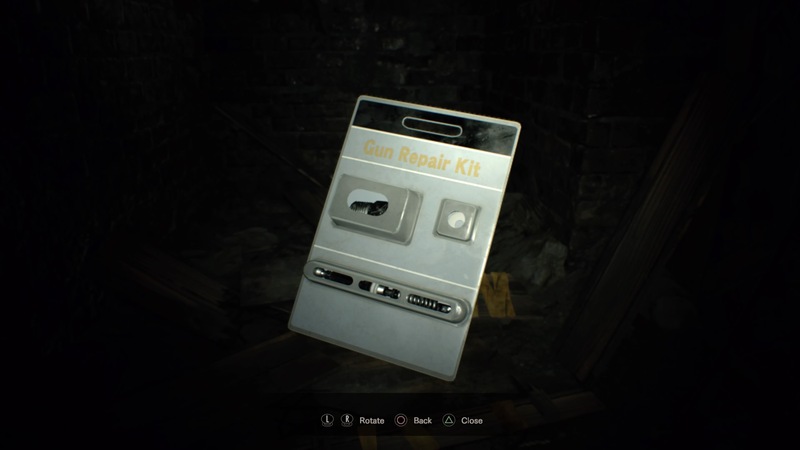 To obtain two of the best weapons in Resident Evil 7, you’ll need to combine a Repair Kit item with the Broken Handgun or the Broken Shotgun. Doing so rewards you with a souped-up pistol or a devastating double-barreled shotgun. Both are vital for the difficult final stretch of the game, and they’re pretty easy to miss. Repair Kits are extremely rare — there are only two in the game, and it’s easy to overlook. Getting the Broken Shotgun is even trickier, but both can be obtained before going too deep into Lucas’ Domain in the Testing Grounds. The Broken Handgun can even be repaired just after escaping the Main House through the three-headed Dog’s Head door. Below, we’ll explain how to get the Broken Handgun and the Broken Shotgun, and where to obtain both Repairs Kits. The Broken Handgun is a worthless item without first using a Repair Kit. Luckily, both the Broken Handgun and a Repair Kit can be obtained right after exiting the Dog’s Head Emblem Door and reaching the Yard area outside the Main House. The Broken Handgun is located in the Trailer, in the middle of the Yard. Find the Broken Handgun on the bed inside, to the left of the door as you enter. The first Repair Kit is also hidden in the Yard. Between the two stairs up to the back porch, look for a loose piece of scrap medal. Remove it to find a crawlspace that contains the Repair Kit. Now all you have to do is combine the Repair Kit with the Broken Handgun to get the M19 Handgun. This is an obvious upgrade, with more stopping power than your average handgun. It only carries 7 bullets per magazine, but the extra damage means you’ll end up saving bullets in the long run, and killing monsters much faster. The Broken Shotgun, found in the Main House 2F, Grandma’s Room, is accessible after you collect the Scorpion Key from the Processing Area downstairs. Normally, you’ll use the Broken Shotgun as a replacement for the Soldier Statue Puzzle in the Main Hall to get the M37 Shotgun, but there’s another use for the Broken Shotgun — turning it into a super-powered double-barrel upgrade. The Broken Shotgun is found in Main House 2F, Grandma’s Room. It’s to the left of the window. It’s likely you’ll find it on your own, but if you missed it (and the M37 Shotgun) that’s where you’ll find it. It is accessible after getting the Scorpion Key from the Processing Area. The second Repair Kit is available after you find both Keycards (Red and Blue) to enter the Testing Ground. To get it, you’ll need to get the third Treasure Map. The third Treasure Map is located in Main House 3F, Attic — you’ll need to solve the Kid’s Room puzzle and collect the Snake Key to get inside. The Treasure Map points to a location in Lucas’ party zone, called the Testing Area. Follow the linear path to Testing Area 2F, and look in the third room for a cage in the corner sporting a mannequin head on top. Get to the Treasure Map location to collect the second Repair Kit. It’s right behind the head. Now you can combine the Repair Kit with the Broken Shotgun to get the double-barreled M21 Shotgun. It only holds two shells, but it packs way more punch than even the formidable M37. Yes, you can return the M37 Shotgun to the Soldier Statue Puzzle to get the Broken Shotgun back. If you want both shotguns, get the Model Shotgun from the Main House 3F, Attic and use it to swap out the Broken Shotgun.